ATLANTA, October 12, 2017 – BasisCode Compliance LLC (www.basiscode.com), a leading provider of regulatory compliance software solutions, is introducing a comprehensive managerial dashboard for compliance consulting firms which allows these fast-growing firms to better monitor and manage the high-level information activity and tasks for their clients and consultant employees. The new consultant dashboard is set to be unveiled at the 2017 National Society of Compliance Professionals National Conference in Washington, D.C., from October 16 to 18. 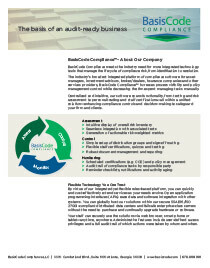 BasisCode Compliance is a Gold Sponsor of the conference and is exhibiting in booth #25. BasisCode Compliance’s new managerial dashboard offers a “one-look” comprehensive summary of the status of all compliance tests, forms, certifications and reviews for clients and for consultant employees providing management with a superior tool for more timely and effective program management. 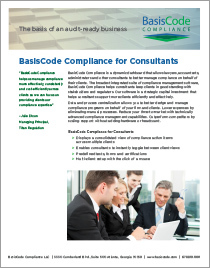 Many of the leading U.S. compliance consulting firms use BasisCode Compliance’s technology platform for their expanding client bases and the growing number of compliance consultants serving them. 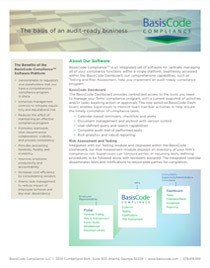 The BasisCode Compliance software simplifies and centralizes compliance management, ranging from compliance testing and risk assessment to trading surveillance, insider trading and staff certifications. The platform provides robust reporting features and an easy-to-use portal for seamless interaction with employees and advisors. The new managerial compliance dashboard was developed in response to feedback provided by the firm’s advisory council of compliance consulting firms which includes Alaric Compliance Services, Cipperman Compliance Services, Hardin Compliance Consulting and SEC Compliance Consultants. or by calling 678-819-1991 ext. 112.